You then break that up, and that is a challenge, into small pieces, set them on edge and again fire to a full fuse. Other than deciding what colour glass to use and how to layer it up, there is not a lot of control over the final result. I suppose it was this that attracted me to the idea; the mystery of the final result. Unfortunately, I didn’t take a photo of the puddle, but you can see in this photo some finished results. Well, for a first attempt not too bad. The puddle worked fine, but I think I should have fired a little longer to get the puddle down to about 6mm in thickness. The breaking was a little nerve-racking. I first used my glass cutter, scored a line on the back of the puddle and tried to break it. It broke, but not down the score. I tried using a mosaic cutter but it would only open to about 6mm and the puddle was about 8mm. So I resorted to covering the puddle with a cloth, placed it on a couple of wooden strips and used a hammer. This worked but the end results were pieces of all shapes and sizes, and with quite angled sides. To then lay them on edge I had to grind an edge so they would sit correctly. After the second full fuse for the cabochons I was happy with the result until I noticed a number of the cabochons had devitrified. Devitrification is where the glass begins to crystallise and results in a hazy surface on the cabochon. This seemed to be only on the opal glass I used. 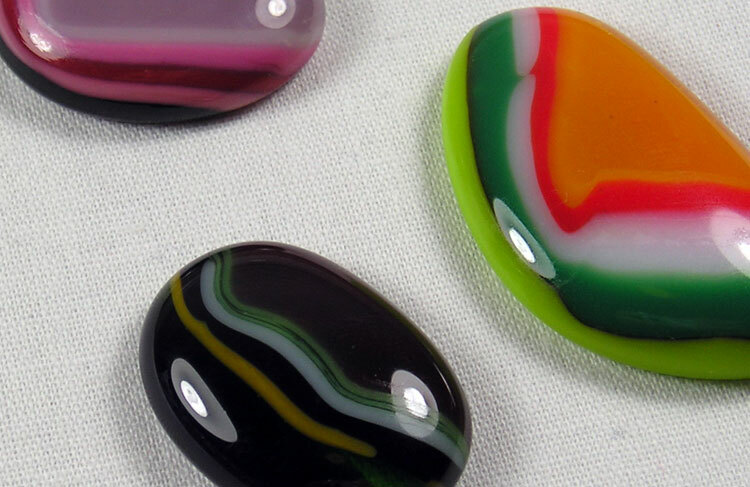 Subsequent research identified that opal glass, and especially BullsEye, is prone to devitrification. So in summary the firing worked, but I will need to work out a better way of breaking the glass, and control the devitrification.